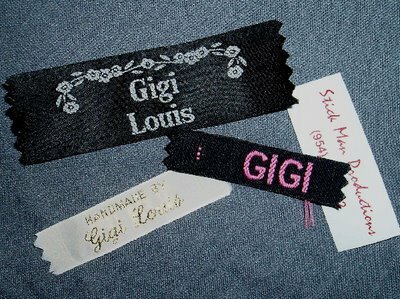 Gigi did a post on small-run label manufacturers. I thought I would add a little to that for folks who are interested in larger quantities – say a small manufacturer, cottage industry or serious hobbyist. 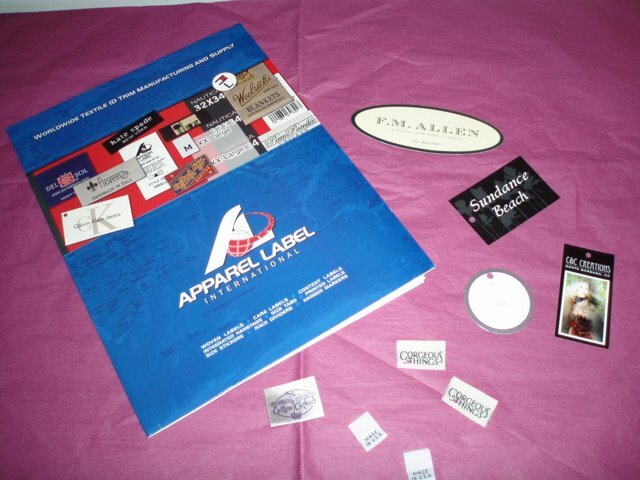 In addition to Heirloom Woven Labels and Sterling Name Tapes, there are several manufacturers that cater to the small to mid-sized business market. I’m not an expert in these things (for that, check out Fashion Incubator. Kathleen et al have lots of information that I don’t for DEs and larger manufacturers), but I have had a little experience with some of the label manufacturers. Not taking anything away from Widby and their quality, I decided shortly thereafter that I wanted to invest in woven labels. They just look higher end than printed. The service at Widby was such that if they offered woven labels, I would have bought from them in a heartbeat. But that’s not their bag, so I looked elsewhere. ClothingLabels4u.com does woven labels. This company spun from Lisa’s Bloomers, an historic undergarment manufacturer. Lisa, the owner of both companies, is great to work with. You supply her with the artwork and she will produce samples matched pretty closely to your colors and will produce the labels at a reasonable cost. I think (and Lisa, if you are reading this, please feel free to chime in) that the manufacturing of the labels is done in India. It takes a couple of weeks to get the labels. They are well made, the resolution is good, the prices are reasonable, and the customer service is excellent. Here’s an example – when I ordered the first set of labels, I didn’t proof the specs as carefully as I should have. So I received straight cut labels. I had meant to order center fold sew in labels. When I talked to her about this, she offered to buy back the straight cuts saying she could use them as samples. I thought that was pretty darned good service. I decided to keep the straight cuts, but I really liked dealing with her. The only nit I have with the labels, was that they could approximate, but not match, the Pantone number for the purple “bug” in my logo. That may have changed Here’s a picture of the two label styles from her. 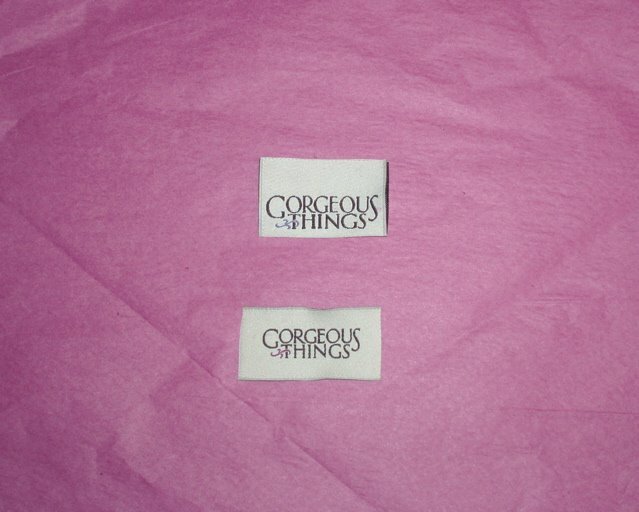 Since I ordered last, she has also added the ability to do custom hang tags, so if you are small manufacturer, ClothingLabels4U is definitely worth checking out. All three label companies do a good job of fulfilling the need. Depending on your requirements, one may work better than the other. All three had excellent service and get a Diva thumbs-up. Hey, check it out! We’re a “Blog to Fill Your Spool” according to the Washington Post. The link above is a companion piece to the article which can be found here. You do have to sign up to read it. The article is titled “Sewing, So Fashionable”, and describes how sewing seems to be on an upswing. Especially among teens and twenty-somethings, the trend is toward more of a “whip it up and wear it tonight” attitude, rather than a methodical pattern development approach that prior generations have used. Needless to say, this is a wonderful trend. I’d love to see a whole new generation of Divas out there sewing. And it is gratifying to see our humble little blog listed along G Street Fabrics, DressADay, Threads Magazine, StitchLounge and others. Another fun thing is that we never contacted, nor were contacted by, the Washington Post. This was a completely unsolicited referral. But to the folks at the Washington Post, we’d love to do a Sewing Divas column (å la Manolo) if you’re game! 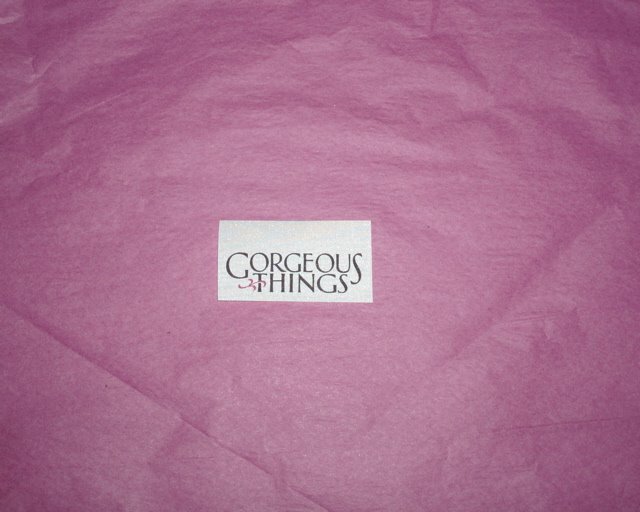 Diva Ann has the most beautiful custom labels from ClothingLabels4u.com that she sews into her creations. If I’m not mistaken, so does Diva Phyllis. I would love to have some made but haven’t come up with any kind of thrilling design for them yet. As a girl, I always used interlocking Gs as my signature but that’s no good as I think the people at Gucci might take issue with that! I don’t use labels that often but they are nice to have around. For years I’ve been purchasing my labels from Heirloom Woven Labels. 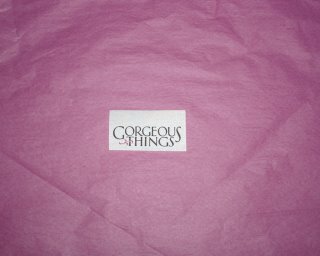 The quality is excellent, the minimums are small and the prices very low. Here are just a few of the labels I’ve had made over the years, all are from Heirloom except for the white iron on label I use in my business – those come from Sterling Name Tape. Sterling Name Tape also manufactures woven labels similar to those from Heirloom although I haven’t tried them. I noticed that the iron-on labels are not on their website – I guess you’ll have to contact them directly to order. I use them on the inside of my athletic uniforms and they stay put through years of hard wear and washing. If you are interested in woven size, care or content labels, you can find those at Heirloom Woven as well. Pat’s Custom Buttons and Belts in Lodi, California is a small but necessary resource for those of us who want the REAL THING. Pat Mahoney runs her business in an ‘old school’ custom one-of-a-kind or many-of-a-kind way. She can work by phone, or by mail and has an excellent spiral bound catalog that she can mail to you. I haven’t seen this selection of covered belts and buckles for ages – it reminds me of when NYC’s Garment Center was a bustling district full of rolling racks, delivery trucks triple parked, carts of fabric bolts perilously barreling down the sidewalk and the cluster of Italian patternmakers took over most of the sunny side of the street in front of 525 7th Ave. You could send your fabric out in the morning and your covered buttons would be back that afternoon. I was in a hurry, so we sent everything back and forth by FedEx. Snail mail works fine though, if you have the time. I love my giant velvet covered buttons, big as dinner plates, with the matching covered belt. She has 6 different styles of button backs to choose from, 16 styles of covered button, and 12 styles of covered button with novelty rims and centers. I won’t even go into all of the belt options. Hooray for Pat, keeping the tradition alive. I don’t suppose she will mind if I say you can contact her at 209-369-5410, PO Box 335 Lodi, CA 95241. Hi – Phyllis here. My daughter (that’s her above) has a vexing habit of using big bath towels when she washes her hair, and inevitably she leaves them all over the house. This past Saturday we were heading home from vacation, and she found this in a duty-free shop at the airport. 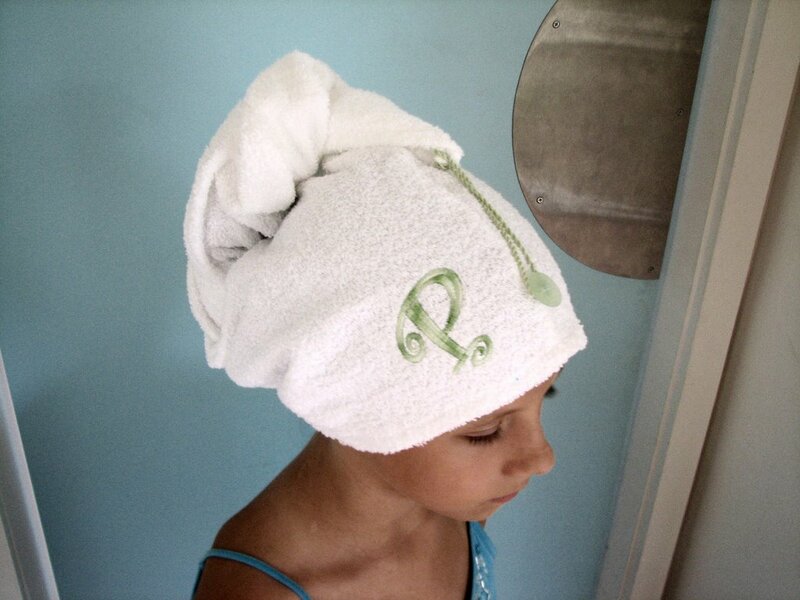 This very cute spa head wrap couldn’t be simpler – it’s two pieces of terry (you can use bath towels), a loop and a button. And it sews up in about 20 minutes. If you want to get fancy a monogram is a nice touch. It’s one size fits all, and they make great gifts. You can see a more detailed review on Pattern Review.